Honda Motor Co., the Japanese automaker at the centre of an air-bag defect scandal, said Monday its president Takanobu Ito will step aside and be replaced by another Honda executive. The unexpected decision follows massive recalls by Honda of vehicles equipped with air bags made by Japan's Takata Corp. 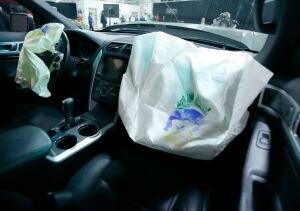 The airbags have inflators that can explode, expelling shards of metal and plastic. At least five deaths and dozens of injuries have been linked to the problem worldwide. Takata airbags are used by many automakers but Honda was the worst affected. Tokyo-based Honda said in a statement that another Honda executive, Takahiro Hachigo, will succeed Ito, who will remain on the board as an adviser. The announcement did not mention the problems with the airbags and came amid a slew of other managerial changes. All the new appointments are subject to board approval at the company's annual shareholders meeting in June. Hachigo handled development of the U.S.-built Odyssey minivan and has guided the automaker's businesses in the U.S., Europe and China during his 33-year career with Honda, the company said. Ito joined Honda in 1978 as a chassis design engineer and has been president and CEO since 2009. The company lauded him for helping to expand its global manufacturing in emerging markets such as Mexico, Brazil, China and Indonesia. U.S. and Japanese authorities have been investigating the Takata air bags. The U.S. fined Honda $70 million, which was the largest civil penalty levied against an automaker, for not reporting to U.S. regulators some 1,729 complaints that its vehicles caused deaths and injuries, and for not reporting warranty claims. Takata refused the National Highway Traffic Safety Administration's demand to issue a nationwide recall of driver's side air bag inflators, though automakers have recalled the cars on their own. The recalls have clouded the reputation of Honda and other Japanese automakers for quality and safety. They also raised costs for Honda, especially in North America, prompting the company to trim its annual earnings forecast after profit in the October-December quarter slipped 15 per cent. The maker of the Fit subcompact, Odyssey minivan and Asimo robot now expects a profit for the fiscal year through March of 545 billion yen ($5.74 billion Cdn), down five per cent from a year earlier. But it said it expects to sell 4.45 million vehicles in the fiscal year that runs through March, slightly above its sales of 4.3 million vehicles in the previous fiscal year.